There’s nothing quite like comfort food is there? When you’re feeling a bit low or upset and you’ve just not had the best of days comfort food always makes you feel better. Warming and hearty it makes you feel at home and content and that everything will be ok in the end. If you’ve diagnosed with a gluten allergy comfort food could be just what you need. You’re bound to be upset and worried and you may feel hard done by. A tasty, comforting meal could lift your spirits, even just for a little while. The problem is however, once you are diagnosed with a gluten allergy there are many foods you must avoid. Any product containing gluten could spark a reaction including headaches, bloating, stomach cramps, bowel problems, fatigue and even depression. However there are plenty of comfort food dishes that do not include gluten and all it takes is a little cooking know-how! Everyone has a favourite comfort food. For some it’s chocolate – who can resist a tasty bar of chocolate? For others it’s a roast dinner, a family favourite that always reminds you of being at home and content. But one classic favourite that almost everyone loves is cauliflower cheese. Tasty vegetables and melted cheese is the perfect comfort dish when you’re feeling a little sorry for yourself. This cauliflower cheese soup recipe is wholesome and delicious and what’s more it’s gluten free. So when you feel the world is getting at you and you just want to make yourself feel better then have a go at this simple recipe and enjoy this old family favourite. To make this delicious soup you will need 1 large onion, 350mls of chicken stock, a teaspoon of dried thyme, half a pint of mil, 150g of cheddar cheese and salt and pepper to season. If you like strong cheese then go for a mature strong cheddar, if not you can use a mild cheddar. To begin, chop the onion into small pieces and set aside. 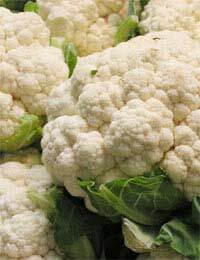 Next chop the cauliflower into chunky pieces and add to a saucepan. Add the onion and pour in the chicken stock. Cook on a medium heat, stirring occasionally until the vegetables start to soften. Once the vegetables start softening add the thyme and salt and pepper and heat for another five minutes or so. Next add the milk to the saucepan and stir. Grate the cheese and add this to the mixture. Stir everything in together and heat on a medium heat until the soup is piping hot. Season with a little more salt and pepper and serve. You can even great some more cheese on top of the soup if you like. If you do not want to use chicken stock it is fine to use water or vegetable stock instead. This cauliflower cheese soup is bound to become a sure fire hit in your house and can be used either as a main meal or as a tasty snack.